„Slow and steady may not be marketable, but that doesn’t change the truth. The above quote perfectly summarises my evolving approach to training, health and life in general as of late. I want to encourage you to keep pursuing whatever goal you are pursuing and view it as a long-term journey. There are no shortcuts or quick fixes that will be worthwhile in the long run. It may take years for your goal to come to full fruition but consistency and perseverance will eventually get you there. If you are willing to put in the hard work, you will very likely succeed. People will be envious of your results and try to emulate your success. They will fail because they will never understand the long and arduous journey you have struggled through to get where you are. They will keep looking for a shorter route that seems easier for them. Sure enough, there will be many bumps along the road – times where you just want to throw in the towel because you are discouraged to soldier on. But there will also be times where you will be overwhelmed with moments of complete elation and happiness because the thousands of dedicated hours you have invested are beginning to pay off big dividends. Cherish those moments, tap yourself on the shoulder every once in a while and simply enjoy the journey. You can’t expect to build a truly impressive and versatile body in the matter of a few weeks or months. You may not even accomplish it in a few years. If your own standards are high, it may even take a lifetime of dedicated training and focus to achieve a truly exceptional physique. However, improving your fitness should not merely be about physically transforming your body. Your fitness results will be more powerful if you can build a physique by learning useful skills and techniques along the way. What I primarily mean by skills is that you steadily acquire the ability to move and control your body in different planes of motion. This could include variations of bodyweight training (=calisthenics), progressions with gmynastics training, running and jumping skills (aka Parkour/MovNat). In my case, I have taken on ring gymnastics training as a long-term goal. 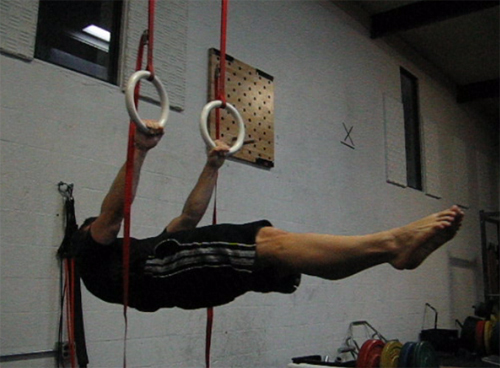 Any gymnastics coach will tell you that mastering different movements on the rings takes time and steady progressions. I started out with the classic mistake of thinking that I could skip progressions and jump right into the more advanced movements. Of course, I didn’t succeed because I hadn’t build the foundational basis which would allow me to progress. For mastering the „Front & Back Lever“ on the rings, I now progressively increase the lever of my body to steadily make improvements. This means that I make the movement harder by moving centre of mass away from the rings (i.e. extending my legs from a tucked position). The same concept of getting results slowly & steadily applies to diet. If you come off the Standard American Diet (SAD) and start with Paleo for example, don’t expecct to eat flawlessly right away. Your eating habits and appetite will need time to make a slow transition. The first few weeks and months you will probably slip up by eating crap food occassionaly. But by practicing the skill of eating optimally, your mindset will eventually adapt and you will eat cleaner & healthier. You will have learnt to easily dismiss all the BS foods you couldn’t resist when you first changed your diet. I have been Paleo/Primal/WAPF for more than 2 years now. Not super long but by now I have established a strong foundation that promotes a healthy eating behaviour. It may take another 10-20 years of further finetuning and experimenting before I develop a diet that is absolutely ideal for my body.